You can now speed up case creation in Pega Intelligent Virtual Assistant (IVA) for Email™ by having the system automatically populate properties with extracted data. 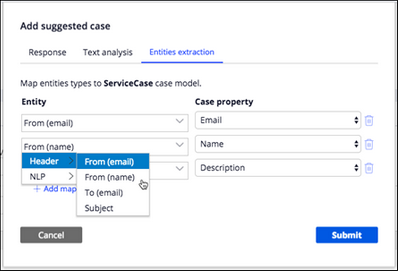 In the Add suggested case section, you can preconfigure entity mappings. You can also use email-specific properties, such as an email address or a subject, in the entity mapping definition. For more information, see Defining suggested cases for the Email channel.